This is the third and final map in my Seaside Conspiracy-Trilogy. According the story, I tried here to make a relaxing map to play, though there are some not so pleasant events to take care of. Too many maps with unbearable difficulty have been created and this is one for the economist and not the warlord. That's why it is with intention not a very hard map. The long war against the Sea-people and driving out the Red Snake Cult from the Northern Islands has cost many resources and human lives. Our once wealthy and resources-rich country became impoverished nearly completely. After our last large victory, we succeeded to catch and execute the Rat. His castle was dragged down and his country was attached to the kingdom. It is time now, to repay to our citizens for their suffering and to build up the destroyed cities and villages again. A great victory celebration is to be held for our new won friendship between King Ralph of Arakanian and King Stephan of the Northern Islands. And all their people shall join in. A last task awaits you. Establish a new castle and a trade post in the former country of the Rat. The country is rich in resources. Resume the interrupted trade relations and lead our kingdom to new prosperity. You have to guard against straggling troops of the Rat. These strife marauding around in the country. Be hard, where you have to and benevolent, where you can. This is a great map from Hanarky! By far your best map in the series, what a finale! The map design is superb and it is very playable. I started well, building up a successful economy and it was quite relaxing as the author intended but I was struggling a little with all the nasty events! There are also a lot of goals to achieve in my opinion, too many which is the reason for the 4 in balance. There was so much to think about and check up on and thwe map became quite tough and a little tedious. The design was superb though, a really great map. I love the whole marsh feel with all the rivers and mountains surrounding it. 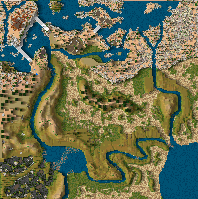 Some of my favourite parts of the map include the wonderfully designed enemies base in the top left hand corner and there is a great mix of mountains and plains with a stunning river and lake system working its way through the map. Really creative and certaibly deserved the 10/10. Good work! Stroyline again very good and so nearly a 5, I would say 4.5 if I could. This is a great end to a superb few maps with a fine storyline attached to it. The site desciption is very nice as well with the useful additon of the minimap. A great advertisement for the map! Overall I really enjoyed this map - I have played nearly all your maps and this in m opinion is by far your finest. Great work and I hope you keep producing maps like this! I experienced the mission excatly as the author intended it to be: relaxing. Some prebuilt farms make it easy to orient oneself and survive the first bad events. Bad things are restricted, so there is no chance for hectic (besides game speed 90). One should have played Harnaky's "Pandoran" before this map, then one could find a convenient way to ensure stone supply. The landscape is wonderful, in its overall impression as well as in ifs numerous details. The shore plains are shaped with fine elevations and some stones spread out. Countless fords cross the streams. Mysterious walkways lead to the enemy bases. Deposits of iron and stone are modelled very tasty. After some time, the scenario enters calm sea. The program of fulfilling the requests is almost as usual - good things are required here (and the workers know some more fords to reach them).